Premiair is a well known distributor of a range of heating, cooling and air quality appliances including air coolers, fans, heaters, air purifiers, humidifiers and dehumidifiers. The company's products are widely available and generally well regarded by their users. The Premiair PMDN-12DMN3 is a medium capacity portable capable of removing up to 12 litres of moisture from the air over a 24 hour period. The PMDN-12DMN3 is compact and light in weight. It is suitable for use in small to medium sized areas of up to 17 square metres. This unit is simple and easy to use, is equipped with electronic controls and has a carrying handle for easy movement within your home. The PMDN-12DMN3 is economical to run and consumes a modest 320 watts per hour when in operation. 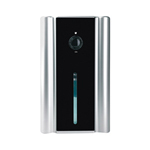 The most notable feature of this appliance is its relatively low noise level of 41dB. For a refrigerant unit of its capacity the PMDN-12DMN3 is one of the quietest models available in the UK. The Premiair PD20DEN is a considerably more powerful unit than the PMDN 12DMN3 and has a water extraction capacity of up to 20 litres per day. As well as extra power the PD20DEN offers a wider range of features, including an ioniser and casters attached to the base for ease of movement. The extra power requires more energy but for a unit in its class the 410 watts per hour consumed is reasonable when compared with the power consumption of the lower capacity PMDN 12DMN3. The PD20DEN is neither too large nor too heavy although it is not remarkably light for a model of its capacity. The noise level produced by the PD20DEN is a rather loud 50dB which is a very large increase over the 41 dB of the PMDN 12DMN3 and a little disappointing. 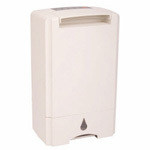 The Premiair PDDS10 is a desiccant dehumidifier. It does not condense water from the air like a refrigerant unit. Instead it captures the moisture using a water absorbing material called a desiccant. The desiccant type does not have a large and heavy compressor and can be made to a smaller overall size and weight than a refrigerant model. Desiccant models are also a little quieter than their refrigerant "cousins" but this advantage can be overstated. The PDDS10, for example has a noise output of 41dB, the same level as the PMDN-12DMN3 refrigerant unit. The main advantage of the desiccant type is its ability to perform well in low temperatures. The ideal use for this type is in a cold garage or boat in winter time, rather than in the living spaces of your home. The Premiair PRDHZ80U is a second desiccant model in the range with a slightly lower water removal capacity than the PDDS10. The PRDHZ80U has all the advantages of the PDDS10 but on the higher fan speed setting it is much louder with an output of 47.9dB. Once again my view is that the PRDHZ80U is very suitable for use in cold, remote locations such workshops, garages and boats. 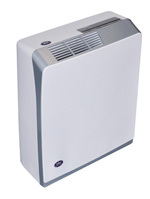 The disadvantages of a desiccant dehumidifier, compared with a refrigerant unit, include much higher energy costs and occasional unpleasant smells which are "normal" and do not indicate a fault in the unit. In addition desiccant units heat the air much more than the refrigerant type. This is an advantage in a cold location but may be unwelcome in the home for some of you; in a bedroom at night for example. 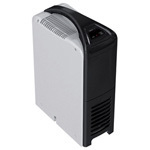 The Premiair PMD1608 Mini Dehumidifier is a small unit which draws very modest amounts of water from the air; about one third of a litre per day in ideal conditions. It uses the "Peltier Effect" to condense water from the air and does not have a compressor. 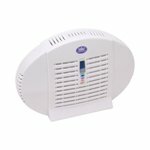 This makes the unit quieter than a full sized unit although it is not silent as it has an audible fan to create the air flow. 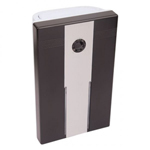 This type is suitable for use in small enclosed spaces, such as a cupboard or wardrobe. Despite claims made by some sellers this type is not powerful enough for use in a bedroom or in any space larger than a broom cupboard! 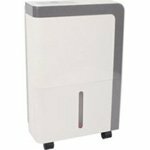 The Premiair EP1608E Mini Dehumidifier works in the same way as the PMD1608 but has a higher water removal rate; 0.65 litres per day. Although more powerful the EP1608E is only effective in confined spaces and would be a poor choice for a full-sized room. The cost of running one of these will not break the bank but it is important to point out that the energy efficiency of these units, expressed as volume of water removed for each pound's worth of electricity consumed, is much lower than that of the smallest conventional alternative. In addition these units are not cheap to buy and I would not recommend them to our visitors. If you're wondering about what type you should choose for your wardrobe the Premiair RMDH-09 rechargeable dehumidifier may just fit the bill. Basically the RMDH-09 is a box of water absorbent crystals. You leave it in your wardrobe, it collects water until the indicator panel changes colour and then you plug it into a power socket for a few hours and it's ready to start work again. The RMDH-09 is not "whisper quiet"..it's silent! There are no moving parts. No moving parts means nothing to wear out so it will have a long working life. The RMDH-09 is small, light, clean, easy to use and it works. For small areas, a wardrobe a car or any other enclosed space, I am more than happy to recommend the RMDH-09 or any other model of this type.